GORGEOUS ULTRA CAMEO OBVERSE CONTRAST! 1956 proof Jeffersons are EXTREMELY RARE with ULTRA CAMEO contrast in ANY grade. NGC has graded only 17 TOTAL examples in ALL grades ULTRA CAMEO. This stunning 1956 proof Jefferson offers incredible snow-white, ULTRA+ CAMEO devices. Pristine spot-free, haze-free, jet-black fields. 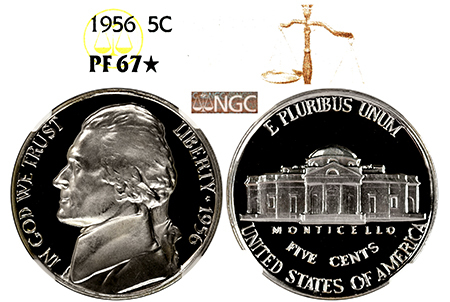 NGC has graded only 47 examples in PF 67 STAR.